ASPEN — Beer lovers looking to wet their whistles at the new Aspen Brewery will have to wait a little longer. The new brewery and tasting room, originally scheduled to open in mid-December, won’t be open until at least the end of the month, said co-owner Duncan Clauss. Delays in construction have delayed the grand opening by more than a month. “We are working day and night to get the doors open,” Clauss said. Clauss expects to get the brewery’s four fermenters operating next week, and it will take two weeks for the beer to be brewed. During that time, Clauss hopes to put the final touches on the interior of the building, located at 557 N. Mill St.
Clauss, and his business partners, Rory Douthit and Brad Veltman, last fall signed a three-year lease in the 2,000-square-foot space owned by local attorneys Ron Garfield and Andy Hecht, as well as several other investors. Aspen Brewery will operate with a manufacturing/wholesale license, meaning it doesn't follow state or city liquor laws, which forbids liquor sales at retail outlets on Sundays. 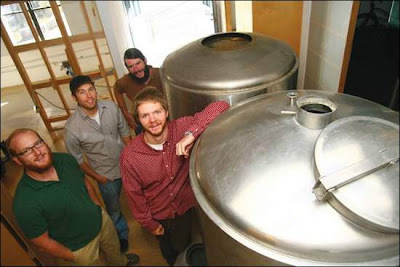 The difference is that Aspen Brewery is manufacturing a product and selling it wholesale. The license applies across the board, so whether a thirsty customer wants to sample beer at the brewery's tasting room or take some home in a growler (a beer-to-go glass bottle), they can do it seven days a week. Commentary: I'm sure that the locals and skiers in Aspen can't bear to wait another few weeks to sample the 1st local brew the area has seen. I look forward to seeing what they plan to serve up when they open up. I've added them to the Colorado Breweries list.